We are qualified to deliver the four - five week Ecovillage Design Education developed by our friends at Gaia Education. The Ecovillage Design Education (or EDE) is a practical course which draws on best practice from intentional ecological communities from around the world to present the different organs of what makes a self sufficient organisation of any scale, what are the key risk factors and once the participants are presented with the main systems that have been found to provide for basic needs in a fair and ecological way they can then start to design these solutions, or any others that they feel are needed into the situation specific case that they are working with. The Ecovillage Design Curriculum or ‘Wheel of Sustainability with it’s four modiules that each have their own relevant subjects that provide a teaching position for experts of that specific subject for that specific region. 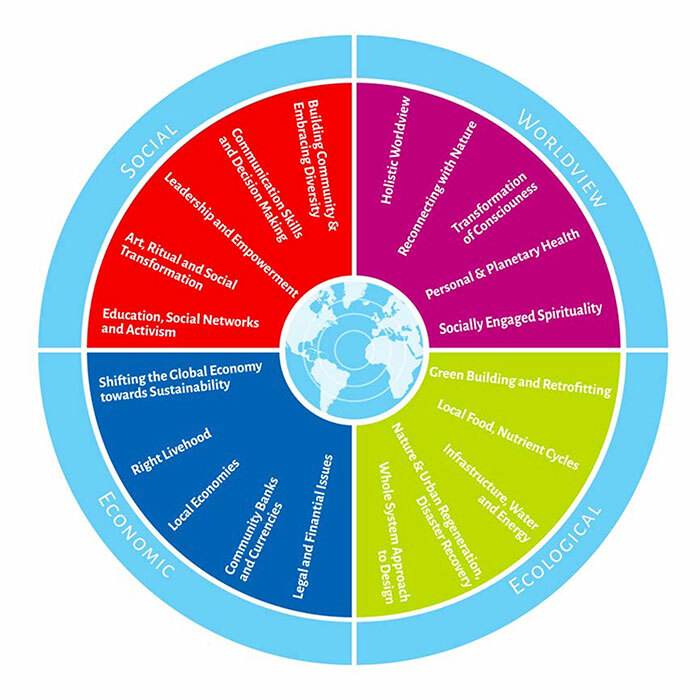 The EDE is broken into four modules: Social, environmental, economic and world view. These in tern are made up of different sections that cover all of the most important areas that a community need to cover if they are to create a totally self sufficient ecological community. Each of these modules needs to be run by a local expert and in tern, each of the smaller sections can be delivered by facilitators who have region specific knowledge. Thus deploying a Green Campus and delivering the EDE we draw in local experts in ecological food production, construction, community economics, traditional ceremony and many other areas of often traditional, highly skilled and all to often marginalised (by mainstream industry and culture) practices. Here is a Green Campus that we put together as a thematic learning environment (because play is technically the best way to learn) for James Cameron and the film makers of the number one best selling film of all time (at the time) Avatar: Na’vi Camp re-skins or themes the four modules of The Eco-village Design Education curriculum in the thematic of the Avatar Universe. 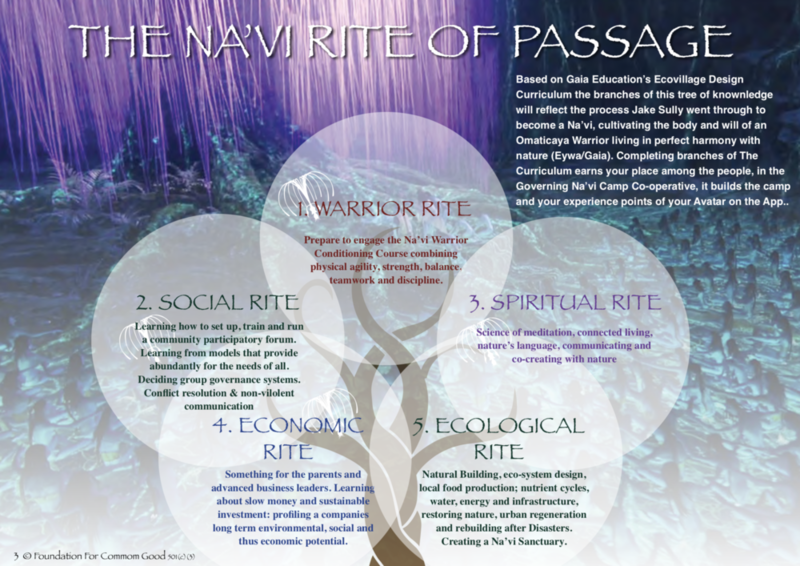 We prepared this Eco-village Design Curriculum for James Cameron, Jon Landau and the other producers of Avatar (at the time it was the highest grossing film of all time). These Na’vi Camps were designed to leverage the popularity of Avatar to bring the Eco-Village Design Education to wider audiences. After an initial positive response from Mr. Cameron we set about building a team of world renowned experts to deliver an amazing EDE for the cast and crew of Avatar: deploying a ‘Na’vi Camp’ where their team could “get into character” and learn how to live like the Na’vi: sustainably and in community. The Na’vi Camp business plan (right) covers the deployment as a regenerative franchise and investment opportunity. Our friends who develop Apple iTunes with Steve Jobs (think iPod, iPhone, AppStore, Apple Music, AppleWatch etc) were there to help us build an app that “game-ified” the curriculum and allowed one to build up their Avatar completing quests (planting trees, geotagging useful ecological assets, establishing regenerative assets for their tribe, building their tribe). We have a little ways to go before we can deliver thematic learning environments like that, but we are slowly getting there and are always in touch with the Avatar team showing our progress; www.ReubenLangden.com is a co-founder of Green Campus which span off from Na’vi Camp. Na’vi Camp is a fun thematic idea with a stellar cast for what you do with a Green Campus and Ecovillage Design Education however we have many more terrestrial opportunities where people would like us to deploy a Green Campus and run EDEs to establish ecovillages and regenerative assets all over the world, as discussed in our Newsletters. The participants of an EDE at Arundel Green Camp present their green businesses pitches to the other Green Dragons (participants) of the EDE.